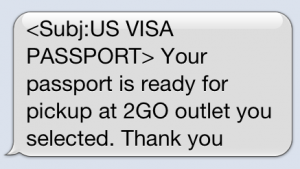 Once your visa is approved, 2Go will either deliver your passport to the location you specified when you scheduled your appointment, or hold your passport at a 2Go office for you to retrieve. There are no extra fees associated with either aspect of this service – the cost for 2Go to deliver or hold your passport is included in the visa application fee. Your fee receipt number. Immigrant visa applicants must mention the receipt number on the letter. Note: In case of a group/family a single letter of authority with the required information for each of the applicants will be accepted. You may change your preferred document delivery address online by clicking this link here: http://www.ustraveldocs.com/ph/ph-niv-deliveryaddressmodify.asp or through the call center http://www.ustraveldocs.com/ph/ph-main-contactus.asp until 11:59 p.m. the day of your interview appointment. There is no cost to change your delivery preferences. Anything I Should Do During My Trip to Visit My Fiancé?